The Red Sox opened their brief 6-game road trip with a 1-0 win over the Tampa Bay Rays on Tuesday night at Tropicana Field. 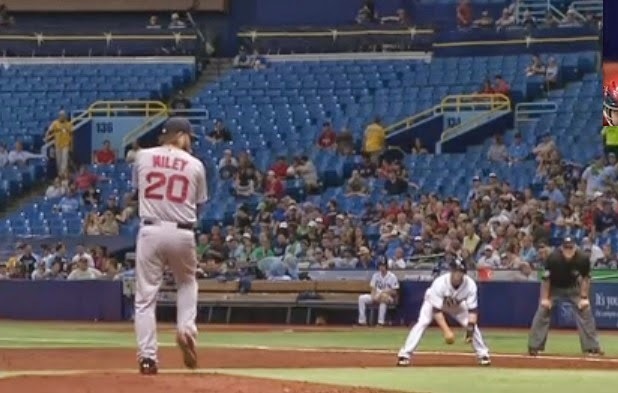 Wade Miley (pictured) went 5.2 innings for the Red Sox, shutting the Rays down on just 3 hits. He walked 4 and struck out 3 in his best outing of 2015 so far. Alexi Ogando, Robbie Ross Jr. and Junichi Tazawa held the Rays hitless for 2.1 innings; Koji Uehara picked up the save with the help of a double play in the ninth inning. Boston took a 1-0 lead in the 3rd inning when Ryan Hanigan scored on a throwing error by Tampa Bay 2nd baseman Ryan Brett. Chris Archer took the loss for Tampa Bay. He gave up the 1 unearned run on 7 hits and 1 walk in 5.2 innings. He struck out 9 Boston hitters. Ryan Hanigan and Hanley Ramirez each had two hits for Boston.